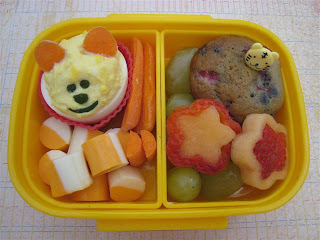 BentoLunch.net - What's for lunch at our house: Preschool Bento #49 - Mice & Muffins! Preschool Bento #49 - Mice & Muffins! Today is Ben's second to last week of preschool. He told me on the weekend that his student teachers (it's a co-op preschool in conjunction with a high school) wanted to see pictures of his lunches because they want to make them too! So of course, we needed an extra cute lunch today to share with them. Mr. Ben had a mouse egg (similar to our chickie eggs, deviled egg with carrot ears & cucumber face), some carrot sticks and chunks of cheese. The other side of the box hold grapes, strawberry/cantaloupe inside out flowers, and a homemade fresh berry muffin that we made this morning. The muffins turned out so good! Chunks of fresh strawberries, blackberries & raspberries. Thankfully, it yielded 24 mini-muffins and 9 big ones, they'll go quick around here. adorable. can you tell me what products you used for the flowers. I want to get a set of cutters but don't know what to look for. Thanks! Aww love the mousey egg! So cute! I love looking at all these awesome idea's! My daughter is three and hasn't started preschool yet so I am just collecting good idea's wherever I can find them. Plus a few cups of diced strawberries, blackberries, and raspberries.